Matki Dance of Madhya Pradesh: Matki Dance is mostly performed in the Malwa region of Madhya Pradesh, India. It is a solo dance performed by ladies on special occasions like weddings, birthdays, or any other special occasion. In the Hindi language, matki means a small pitcher or a small earthen pot. 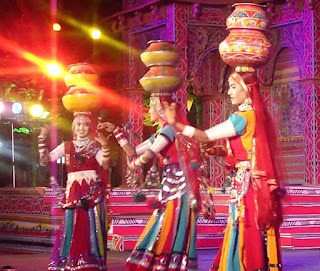 In this dance, the ladies are dressed in sarees or in lehanga decorated with many ornaments. The main musical instrument used in this dance is the dhol. Matki dance is generally performed in a circular position. Women balance an earthern pot on their head. They also have a veil on their face. Women while performing their dance has to balance their pot so that their dance will be considered as an auspicious dance. Additionally this solo dance inhabits beautiful and colorful attires. This dance is also known by other names such as Khada Nach and Aada. Women even wear veil on their face while giving performance for this dance. Malwa region in Madhya Pradesh has got a fair number of dances and other recreational activities. Therefore Matki dance is also performed widely by the talented dance performers at the time of wedding events.